Tony Blair's plans for reforming the House of Lords lie in tatters after MPs rejected all of the options available to them, ranging from a fully elected chamber to a fully appointed one. The prime minister's preference for a fully appointed "revising" chamber gained the least support while an 80% elected, 20% appointed Lords was the least disliked option. Among those voting against were four cabinet members and 21 ministers out of a total of 179 Labour MPs. The cabinet ministers were Education Secretary Charles Clarke, Trade Secretary Patricia Hewitt, Welsh Secretary Peter Hain as well as Commons' Leader Robin Cook. A spokesman for Mr Blair said: "This shows there is no consensus on any of the options in the House of Commons. "The task now is for the joint committee to examine the votes in both the Commons and the Lords and bring forward their conclusions." MPs went on to reject every other alternative in a series of free votes. The prime minister's desire for a fully-appointed House of Lords was rebuffed by 323 votes to 245. Members also rejected the idea of a wholly-elected upper house by a slim 289 to 272 margin. 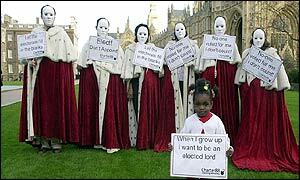 An 80% elected, 20% appointed Lords went the same way with MPs voting by 284 votes to 281 against. Then they rejected a 60% elected, 40% appointed house by 316 votes to 253. The House of Lords, however, backed the option of an all-appointed chamber by an overwhelming 335 to 110 votes as the reform debate reached a critical stage. But a series of proposals that involved partly elected, partly appointed versions of the Upper House were roundly rejected. MPs rejected without a division the options of an 80% appointed, 20% elected chamber or a 60% appointed, 40% elected upper House. Ahead of the votes, Mr Cook stressed his desire for a largely elected second chamber as he argued it was crucial MPs came to "one single commanding view on the way forward". But once all the options were rejected he conceded that it might be a good time to "go home and sleep" on the events of the day. MPs rejected a bid by Labour left-winger Dennis Skinner to abolish the Lords by 390 votes to 172. Mr Blair made it back from his summit with French President Jacques Chirac in time for the key votes. Number 10 says the whole point of a free vote is for MPs to be free to express their opinions, but it is rare for ministers to challenge the prime minister's views openly. Leading that challenge was Mr Cook, who restated to the Commons his belief that a largely elected second chamber was right in principle. It was the only way to create a system that had both public support and would stand the test of time, he argued. Opening the Commons debate, Mr Cook said: "The house has an opportunity to bring down the curtain on what has been the longest political indecision in our history." In the event there was no conclusion in what is likely to have been an extremely embarrassing episode for the government. Mr Cook said MPs should "celebrate" the fact that there would be differences of opinion over the shape of reform. "I think what is crucial is that the Commons does come to one clear, single commanding view on the way forward," he said. In the modern world, legitimacy was conferred by democracy, said Mr Cook. The leader of the Conservatives in the Lords, Lord Strathclyde, said the government's strategy had "backfired". "Conservatives want to see a stronger second chamber, trusted by the people and better able to hold ministers to account," he said. All the results of Tuesday's votes will be examined by the joint committee of MPs and peers looking at the issue on 25 February. Committee member and Labour MP Joyce Quinn: "During the course of the debate and vote it became clear that a number of members back the idea of indirect elections but their votes were split between elected and appointed," she said. "One by one MPs knocked down the options"
"The government is in a terrible mess"
How should it be reformed?